Do you feel unease with your current life situation? Do you feel stressed, drained, and unmotivated? In Traditional Chinese Medicine (TCM), suppressed negative emotions are one of the many causes of illness. As we unleash the tension from our tissues, we also start to restore harmony from within. Over time, with consistent practice, we'll start to feel more positive, happy, and energetic. This training draws on the wisdom of ancient Traditional Chinese Medicine (TCM), and is designed to help you regain healthy balances in all dimensions of your life. For thousands of years, TCM has been widely practiced in China to improve people's body and mind. According to TCM, there are twelve regular meridians and eight extraordinary meridians. While the regular meridians are used for healing purposes (such as headaches, body pains, indigestion, skin problems...etc), the eight extraordinary meridians are for spiritual pursuit. Learn in this teacher training the works of the twelve regular meridians, each meridian's associated emotion, colour & sound. As well, you'll find out which Yin poses correspond to each meridian and learn how to apply them intelligently into your sequences. The training also serves as a much needed space for self-inquiry and contemplation. Each day, you'll study Yoga and Buddhist philosophies, as well engage in daily meditation, journaling, and mindfulness practice. Yin yoga is for everyone. Even if you don’t intend to become a teacher, the wisdom and knowledge gained from this training will help you find harmony from within. As we improve on our well-being, we also manifest better relationships with our loved ones and others in our world. This course is vital if you’re looking for a positive shift in your current life. The goal of yoga is mukti (freedom). This training serves as a stepping stone for you to get closer to a state of being free of mental and physical pain. AcuYin sequence: A unique Yin sequence infused wth acupressure points. To truly experience the transformative potential of this course, you're required to stay receptive to new ideas. Minimum six months to one year of yoga and related practices (such as Qi Gong, Tai Chi, meditation) are recommended. 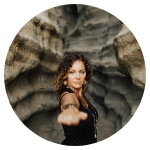 You'll have the opportunity to learn the wisdom of Yoga/Buddhist phliosophies and expand your current beliefs and finding harmony from within. By completing the 50hr Yin Yoga Teacher Training, you'll receive a 50hr Yoga Alliance certification and can be applied as Continue Education Units (CEU). Upon acceptance into the training, you must submit a $300AUD non-refundable deposit to secure your spot. The remaining balance is due on Feb 15th, 2019. Airbnb is the best option if you are traveling and need a place to stay. The city/valley is just 15 minutes from the studio and very close to the ferry. If you need help finding accommodation, please contact the studio owner Bree at 0420 765 617. Click on the button below and complete the registration form. The acceptance process is based on your approved application and intentions for taking this training. We highly encourage you to complete the form as fully as possible. Take the time to answer the questions from your heart. From your heartfelt intentions, we would know how to serve you and whether this training would be suitable to fulfill your desires. We will reply to your application within 24hrs. Annie Au is amazing ! She is so knowledgeable and has a way of teaching that is so easy to understand . The Yin training was amazing ! Everything about it was great!